Off to one of the best starts in recent years at 3-1-1, the girls team is looking to build on last year's season with a combination of talented returning players and promising newcomers. Among the returning players, seniors Emma Dean and Jennifer Lowe will be vital to the team’s defensive line. Shoring up the defense will be senior goalie Nyla Mulcahy, who already has 18 saves on the season. At midfield, the squad will look to important contributions from Lauren Renna '17 and Ava Diggins '18 and continued leadership from seniors Sabrina Marques and Erica Phiansunthon. Leading the frontline will be sophomore Hayley Goldin, who recorded her first hat trick this season in an opening-day 8-0 win over Bound Brook, and Mia Kirby '18, who has three goals for the season thus far. Newcomers to watch this fall include defenders Samantha Lowe '20 and Catelyn Woelfle '19. 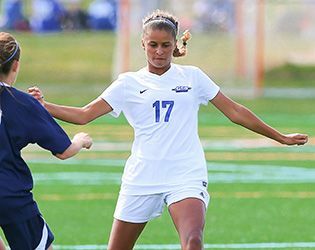 Lowe has two assists and one goal thus far; Woelfle has three assists and a dramatic unassisted overtime goal to give Gill a 1-0 victory over Blair Academy on September 12. Among the newcomers, the team will also look to increasingly significant contributions from freshmen Lexi Yates and Teresa Zimmer in the midfield. Gill suffered its first loss of the season against key conference-rival Rutgers Prep on September 15, and the rematch on October 14 at home will be an important contest for the Knights. Another key conference matchup will be North Plainfield; the Knights face them at home on Tuesday, September 20, and away on Tuesday, October 18. Finally, games against Belvidere High—at home on Thursday, September 22, and away on Thursday, October 20—hold conference implications as well.